It’s that time again! Bottling! When you have a small amount of space dedicated to brewing, as I do, keeping things running efficiently from carboy (Primary fermentation) to jugs (Secondary fermentation and clearing) to bottles is essential to ensure that mead production continues efficiently. All my jugs were full, yet I have a batch or two ready to rack into the jugs, so bottling was the quagmire — as it often is. 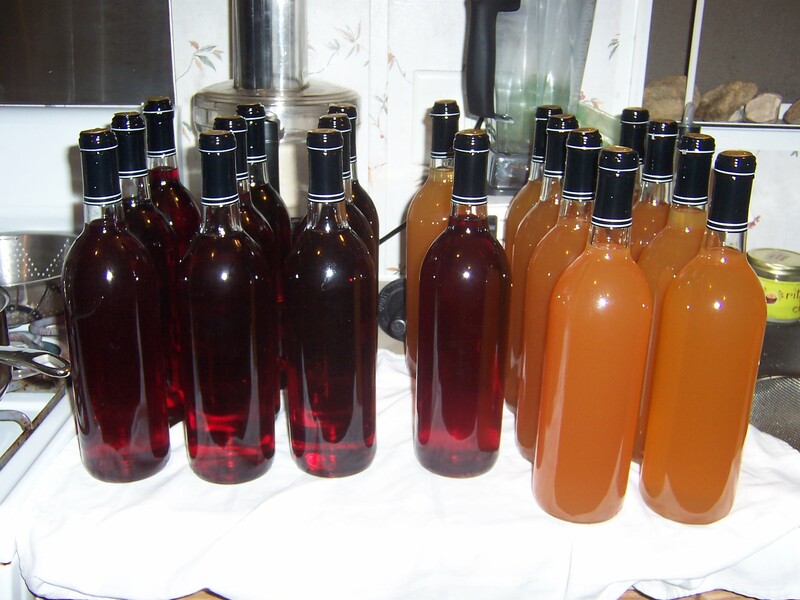 Bottling is probably the most work of the entire meadmaking process, especially if you are cleaning recycled wine bottles. As you can see, the Prickly Pear (on the left in the photo above) remains just an absolutely stunning color, it looks (and almost tastes) like a deep red wine, almost merlot-ish, with purple overtones when you hold it up to the light. The Coca Kola Mead still has some clearing to do…. it might have been smarter to rack it again into another jug, since it has been sitting in more coca leaves and kola nuts in the secondary fermentation stage. Ah well, I wanted to keep things moving so I just went ahead and bottled it. 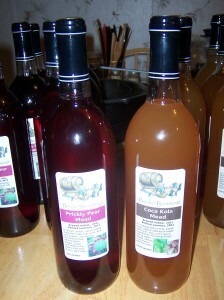 Most likely the Coca Kola Mead will settle out in the bottles over time. It needs some time to age some more as well. Next up: rack the Spruce Tip Mead and the Dandelion Sumac Mead into jugs, freeing up carboys to make another raspberry mead and a choke cherry mead. Watch this space for updates on each of these batches to be done in the coming days.